Even if you’ve been to the Disneyland Resort countless times, there’s always something new to discover. That’s the magic of Disney – especially during Holidays at Disneyland Resort when snow falls on Main Street, U.S.A. and both parks sparkle with yuletide splendor. Through Jan. 8 2012, the resort transforms into a winter wonderland – California-style. As lifelong L.A. residents, my family cruises down to the Disneyland Resort a few times each year, and always during the holidays. We’ve learned along the way how to keep our visits fresh and have fun as a family year after year. At the top of our list: instead of dashing around trying to see and do everything, we choose “must-do” attractions (basically our favorites) and leave room for delightful surprises along the way. By slowing down the pace to shop on Main Street, sample holiday goodies and visit Santa’s reindeer at Big Thunder Ranch (and pose for pix with Santa! ), we’re able to let the resort’s magic happen. While on Main Street, for example, my daughter was thrilled when she happened to see the lighting of the 60-foot-tall Christmas tree – a truly magical moment! On a recent visit, we took time to listen to carolers, enjoy seasonal shows and to indulge in scrumptious holiday treats (for the first time!). Candy shops are stuffed with holiday goodies, such as Snowman Apples, Snowman and Peppermint Marshmallows, Peppermint Pretzel Rods, and Christmas Cupcakes. Disneyland also makes its own candy canes, available for a limited time on a first-come, first-served basis. In addition, eateries whip up tasty treats. Among our favorites served at California Adventure: a warm San Francisco white chocolate & cranberry bread pudding, and a holiday brownie skewer (with strawberries and marshmallow). New at “it’s a small world” holiday this year is a 14-foot sparkling snowman dressed in a gold top hat, golden scarf and hundreds of twinkling lights. The snowman’s “Happy Holidays” sign is sculpted out of ice that changes color. At night, the attraction’s exterior glows with more than 300,000 lights. 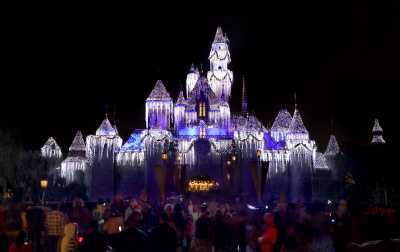 Not to be missed are Disney’s seasonal shows – a surefire way to get in the holiday spirit. Disneyland’s “A Christmas Fantasy” parade is a high spirited, festive parade featuring Disney characters and Santa. Just as energetic is the Phineas and Ferb’s Rockin’ Rollin Dance Party, a lively street show with a merry twist in California Adventure. And although we’ve seen it many times before, we never tire of Believe . . . in Holiday Magic, a fireworks show that ends with “snowflakes” swirling down on Main Street, “it’s a small world” Mall, and New Orleans Square. For more information about holidays at Disneyland Resort, visit www.disneyland.com/holidays and for hotel and ticket offers, visit www.disneyland.com/offers. The holiday parade totally got me in the holiday spirit! Santa, skating, snow – and then sunshine. Good combo!